A group of students have rallied to the cause after one of their fellow pupils spend some time in Our Lady Of Lourdes Hospital in Crumlin, Dublin. 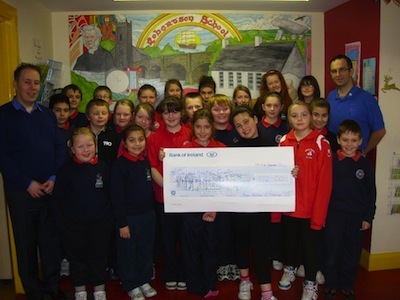 The pupils of Robertson N.S., Stranorlar who collected €172 for Our Lady’s of Lourdes Hospital, Crumlin by having a fun day at school. The fundraising venture was inspired by Emma Gallagher who attended the hospital this year is recovering very well. Emma was delighted her classmates collected for the hospital she attended. Also in the photo, is all of Emma’s classmates and on the left is Brian Bovaird (Principal) and Niall Mulrine (Crumlin Hospital representative) on the right.